Are you one of those careful drivers who has never been in an automobile accident? Do you rarely drive but are tired of paying $100 or more for basic auto insurance coverage? Well, there is a new startup called Root Insurance that wants to shake up the auto insurance landscape and take on established providers like Geico. The premise is simple, reward good drivers with better rates based on their lower risk profile. While some direct insurers offer savings up to 15%, Root car insurance can save drivers over 50%. So exactly how do they do it? The tech start-up strictly focuses on excellent drivers who own smartphones. The company began offering service on October 25th, 2016. Customer rates are data-driven. 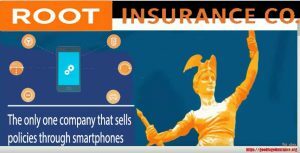 By using Telematics via a person smartphone, they are able to offer cheaper rates than nearly any insurer in the U.S market for those drivers who pose the least risk of filing a claim. The company targets what is known as low-risk motorists. By downloading the companies app, you can begin the qualification process. Currently, the Root Insurance app is on Android and the iPhone. Once you’ve installed the application, the next step is to take your drivers license and scan it in. After that, you will wait for about two weeks, while your data including your driving record, address and other metrics are analyzed. During the same period your personal information is being combed through, the app is actively analyzing your driving behavior. Each move you make behind the wheel, from acceleration, frequency of lane changes, to stopping, to speed is critiqued and run through risk analysis. Once the data is crunched, root will give you a price quote. One of the differences of Root Insurance Company from other competitors is rates are calculated based on driving metrics, not a persons credit rating, marital status, education etc. like other carriers. So what happens to all the people who do not qualify for Root’s rigorous criteria? The answer is simple and what you would expect. They are referred to other mainstream insurers like Progressive or Esurance. While the company did not state what percentage of applicants were approved, the number is probably around 20% or less. With about 223 million licensed U.S motorists, that is still a huge market the small insurer is going after. So far, the start-up is in Texas, Utah, Ohio, Oklahoma, Pennsylvania, Mississippi, Kentucky, Arizona, Illinois and Indiana. In the next year, Root ins plans to roll out its coverage nationwide. Anyone not in the states that are currently served can sign-up and get notifications when the company will begin covering their area. Alex Timm’s insurance experience dates back to when he was just 14. He has always had a passion for the industry and sought ways to improve it. One way he decided to do so was by lowering premiums through recent advancements in technology. Just like Uber can use smartphones to track drivers behavior, Timm sought out the same technology to find good, safe drivers that deserved cheaper rates. Alex started out at Nationwide after graduating from college, but grew frustrated inside the large bureaucratic insurer. He was inspired to start his own company by harnessing the power of technology to create fairer, lower priced auto insurance for the lowest risk pool of drivers. At the core of the Root vehicle coverage is fairness. Alex says, “It’s all about giving fair deals to the safest drivers.” CEO Alex Timm first received his initial funding from a local venture firm, Drive Capital. The money was used to roll out service in Ohio initially and develop their app. Recently, Root has acquired further financing to roll out its service nationally. The question now is whether motorist will want to have their driving monitored constantly to save on coverage. There are some obvious pros. For those that don’t mind, the savings can be as much as 50%. The cheapest rates are $12 a month, which is about the best deal you can find anywhere. To get this rate, you need to have no accidents, drive safely and not much. Getting Root can save you $700 or more per year, based on the national average for premiums. Root offers liability, collision and comprehensive insurance which makes their coverage comparable to other large carriers. The cons are the service is not currently available in all states and you must be a very safe driver. If you like to drive fast and brake hard, Root is not for you. You can go to other sites like Good To Go Insurance and get covered cheaply. Overall, the company should gain traction from technology focused drivers, such as millennials and gain market share as they build out nationwide. As long as they are able to offer rates that are 50% below other mainstream competitors, they will not only get noticed but get lots of new customers.